At my former workplace, I generally made hundreds of cinnamon rolls, not a few dozen. For this post, however, I want to share with you another recipe that has probably crossed the floured work table of many bakers over the years. It is a loosely adapted version of the famous cinnamon buns from franchise stores that literally make shoppers stop in their tracks (has this happened to you, too?). It is an interesting recipe and fun to make with a surprise ingredient – vanilla pudding mix. (If you want to make your own vanilla pudding powder mix, I will provide a recipe soon.) These cinnamon rolls are quite rich, so an icing glaze or cream cheese frosting might be a little over the top. It’s your choice, of course (and just in case, the recipe for cream cheese frosting follows the recipe and its variations). 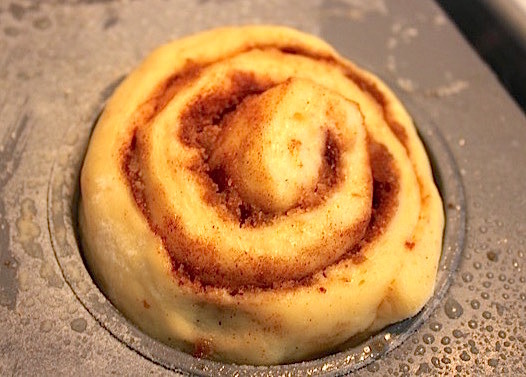 First, the recipe for the cinnamon buns; then using photos, I show you how you can use the dough to make totally different variations of the cinnamon rolls. I hope it inspires you to try making cinnamon buns in a different way. Share them with your neighbours or have a spontaneous coffee party. 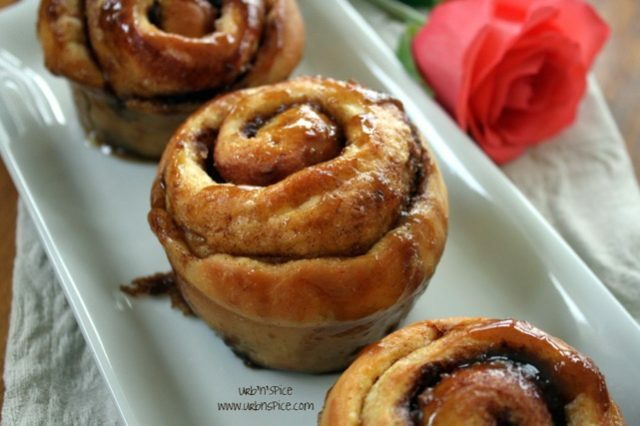 When the cinnamon spice fragrance of these buns drifts outside of your house to the street, you will probably have folks lining up at the door anyway. Put the coffee on – Enjoy! Combine the soft butter, brown sugar and cinnamon together to make a paste. Set aside while you make the cinnamon roll dough. In a bowl or measuring cup combine the warm water, yeast, and sugar. Stir. Set aside for five minutes. It will get all bubbly and frothy. In a large bowl, prepare the vanilla pudding according to package directions. Add the melted butter, eggs and salt. Mix well. Add the yeast mixture. Blend well. Gradually add the flour; knead until smooth. Place in a greased bowl. Cover and let rise until doubled. Punch down the dough and let it rise again for one hour. Roll out the dough on a floured board to 34 x 21″ size. Spread the Cinnamon Filling on top of the dough. Roll up very tightly into a cylinder. Proceed to Method for Cinnamon Roll Assembly below. With a serrated knife, cut the cylinder into 1 1/2″ pieces and place them on a parchment-lined baking sheet, leaving some space (about 2″) in between each piece to allow for proofing. The other option is to place the pieces into greased muffin tins. Cover with a tea towel and allow to rise in a warm draft-free spot until double in size again. Bake for 15 – 20 minutes or until the rolls are golden brown. Place the cylinder of cinnamon dough on a parchment-lined baking sheet. Cut the cylinder in half lengthwise down the middle. Now turn one of the cylinder halves so it is back to back with the other half. Next, holding on to one end of the two halves, twist the entire cylinder so that the two pieces intertwine together to create one cinnamon roll twist. Form the now twisted cinnamon roll into a circle and seal the two ends together to form a ring. 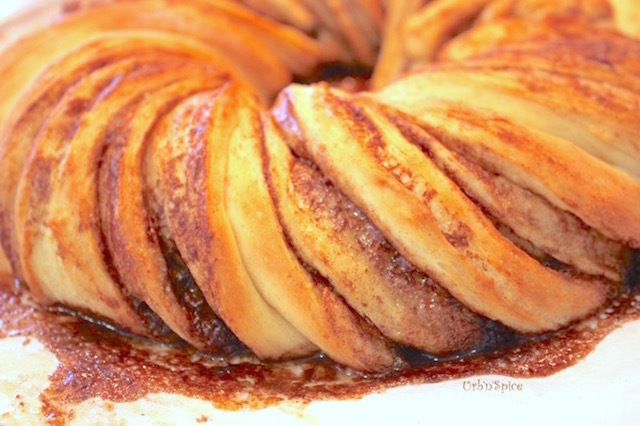 Bake the Cinnamon Roll Twist Ring for 30 minutes or until the ring turns golden brown. Place the cylinder of cinnamon dough on a lightly floured work surface. Now turn one of the cylinder halves so it is back to back with the other half and the two exposed halves are facing out. Twist each half slightly individually. Next, holding on to one end of the two twisted halves, join the two halves together and twist again so that the two pieces intertwine together to create one cinnamon roll twist. Cut the cylinder into 1″ pieces, and cut each of those pieces into quarters. Place the pieces into the individual heart shaped pan in an attractive pattern. Depending on the size of your heart shaped pan, you might need to use two pieces cut into quarters. The dough will need to be proofed until double in size, so allow for that expansion. Bake the individual heart-shaped cinnamon rolls for 10 – 15 minutes or until golden brown. NOTES: If you would like to glaze or ice the cinnamon rolls, a recipe for cream cheese frosting follows. I am inclined to leave them as is, but once in a while, a cream cheese frosting is just the ticket. You can always put the cream cheese frosting in a nice display dish with a spreader on the table so that your guests can help themselves or individual pots like the photo below. Combine the cream cheese and the softened butter to a smooth paste. Add the vanilla bean extract. Add the icing sugar and blend well. Add enough milk to make a spreadable frosting. 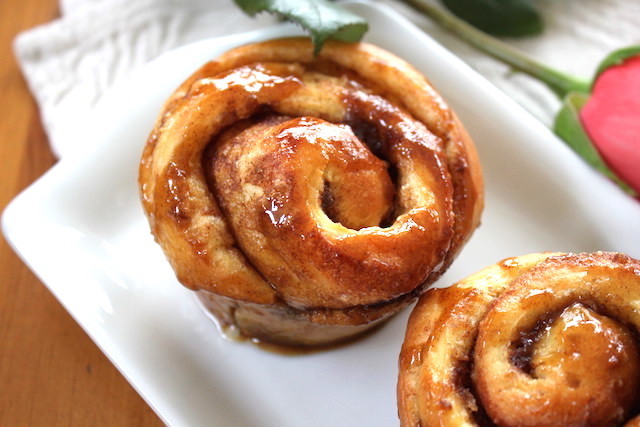 If you give this recipe for Cinnamon Rolls with Vanilla (or their variations) a try, please come back and leave me a comment below with your feedback. You can find me on social media – just be sure to tag @urbnspice and #urbnspice so I’m sure to see it. Enjoy! Oh my goodness! I’ve never attempted to make cinnamon rolls, or swirls, or hearts, or ring!! Cinnamon buns/rolls are new to me, but their smell alone captivates me. If I try making them, I’d have to half the recipe though, is it okay? And what can I substitute for the pudding mix? Thank you so much, as always, for all the useful tips, pics, and explanations! Thank you for your lovely words, Nicoletta. You will love working with this dough – it gets me each and every time. We have the same love of making, feeling and handling dough, I think. 🙂 Yes, definitely, you can make half of the recipe with great results. I have substituted Greek yogurt (with vanilla paste added) for the pudding mixture, and I have also made my own dry vanilla pudding mixture so that I am able to control the ingredients that go into the mixture. I will post that experiment soon if you like. I prefer cinnamon buns baked tightly together… although I do like how they look in the individual muffin cups. I must give that a try. Great post! Thanks for sharing.